At about stage two, Q-YO Blaster starts to fire missiles at you from somewhere off screen. This is hardly a new development for scrolling shooters who routinely hurl artillery at your lone fighter crafts, but there’s something different about this missile. It’s not smarter than the others; it carves a straight line through the screen regardless of your positioning. If it does hit something, it doesn’t burn half the world away in a fiery ball of overkill, so it’s not notably stronger, either. For all intents and purposes, it’s just your regular rocket. Except this one has a ladybug tied to it. I can’t get that ladybug out of my mind. What purpose does she serve? Is she a willing passenger, strapped down to the rocket by her own free will? Is she a biological implant of sorts, a living part of the machine? Is this some kind of punishment? Has she perpetrated some sort of ill towards the invading insect forces and her penance is to be tied to a missile and fired at the enemy? Does she even know what’s happening? Is this a way for the insect horde to allow their dead or non-functioning to take part in their glorious war? I don’t know. I fear I’ll never know! 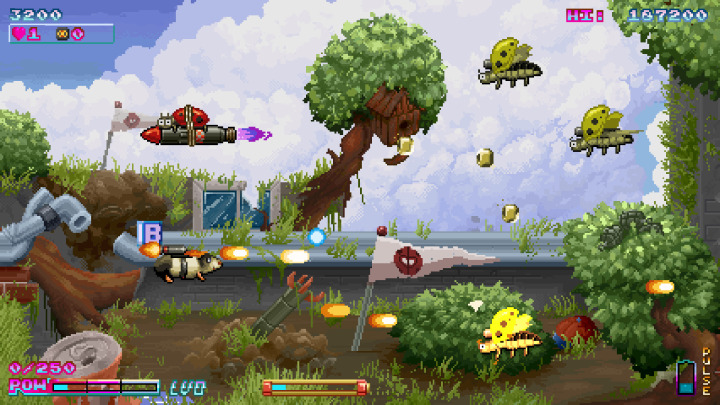 The mundane reality is that the missile-bug is probably just a way to tie a visually uninteresting weapon into the invading insect theme, because if Q-YO is about anything, it’s about spectacle. A little like Cuphead, a game that stood out with its nostalgic animations, Q-YO is a fantastic tapestry of retro styled cartoon aesthetics, but rendered in pixels rather than hand drawn. It’s a busy scenario, determined to impress, and it routinely does so with a commendable attention to detail. Friendly multi-limbed computers point out invading forces with white-gloved hands. The shadows of doves flicker through light cloud cover. Take on a hive of bees and get smiling globs of honey hurled at you while you navigate the peaceful back garden vista around you, full of swaying climber plants and jostling leaves. So much effort and attention to detail has been ploughed into Q-YO that you’ll still find new things to marvel over several playthroughs in. Do well enough against the hive, and the queen bee bursts forth (resplendent with her little crown and regal sceptre) to hurl bullet patterns and misery at you. Weave through her offense long enough and you’ll win the battle. But a sharp-eyed player will spot that, for a few scant seconds after her defeat and before she explodes, the queen’s a much sorrier visage, complete with dishevelled, umm, bee-fur(?) and plastered in band aids. There’s always something new to visually impress the observant, but it’s not quite enough to distract from the fact that Q-YO is often lacking in impressive set pieces. Some of the boss battles have their moments, but there’s rarely a bubble of high-octane offense to surge through or stand out flashes of enemy placement brilliance to marvel at. It’s a shame, because Q-YO presents quite a few atypical shooter mechanics that would really shine if presented in a more hectic game. You can obtain and store pulses, for instance, that turn all the incoming projectiles into collectable coins. Collecting these coins is not only healthy for your always-blossoming scoreline, but slowly fills your special bar. Fill it, and you’re granted the use of one of numerous special attacks you can equip at the start of the game. Successful players will find further options unlocked the more of the game they complete. They’re often pretty simple to unlock. Thanks largely to its short half-hour run time and generous supply of continues, you should reach the end of game credits of Q-YO Blaster without much issue, especially if you pick the easier of the two initial difficulty settings available to you. Amid the congratulations offered to you for saving the world from an army of angry insects, the credits start to drip down the screen as you’ve seen hundreds of time in various media. It’s so commonplace that mentioning it should be asinine, but for one fact; featured rather prominently on the list is the game’s translator, demanding something like third billing. That takes some bare-faced cheek, because while almost every aspect of Q-YO is at least commendable, the translation is abysmal. That’s not a complete disaster for a scrolling shooter because they’re hardly famed for their dialogue-heavy approaches. But Q-YO’s brief plot explanations and character bios are ridiculously incoherent, and it takes a special kind of person to run their text through Google translate blind and then claim some kind of credit for the ensuing travesty. I don’t know; perhaps the jumbled gibberish that the game advocates as text is a purposeful shot at emulating the likes of Zero Wing, more famous for its nonsensical ramblings than its unremarkable product. Point is, Q-YO makes a play at a tale consisting of a genius inventor hamster fighting against an army who might have captured and enslaved his friends, maybe? There’s a guy called Rob and he’s baked a cake and that’s important for some reason? It probably doesn’t matter. 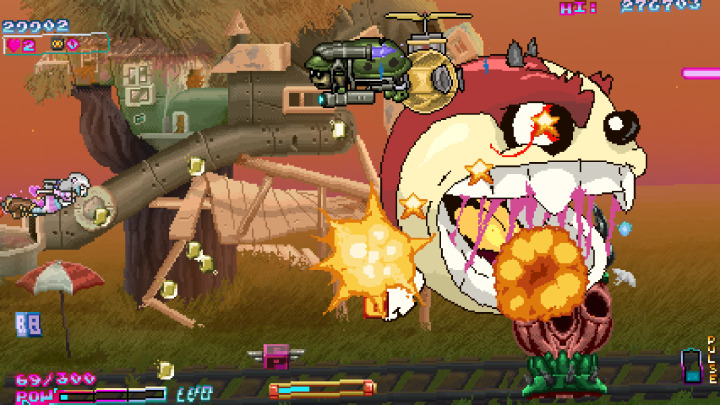 In Q-YO Blaster, we’re talking about a game that offers the decapitated head of an infected dog corpse or a caterpillar surfing a leaf and shooting his own excess body hair as some of their selectable fighter crafts. It’s probably not supposed to be taken particularly seriously, but it still hurts the game. Especially when it’s trying to explain how a mechanic or perk works. Complete a level and you’re offered the chance to purchase a permanent ship upgrade. Some of these make sense, such as a speed boost or an extra life. Another lets you increase bullet "cadence". I recognise that as a musical term; I’m not sure what that’ll do with bullets and its purchase didn’t seem to make any noticeable difference to my attack patterns. Even though it’s a short game, sometimes stumbles like that gang up on you and the brief war against the insects threatens to become a chore. But then something catches your eye. Perhaps the way that enemy beetle’s wings flutter manically in an obviously frantic attempt to keeps its bulky body airborne. Or maybe you’ll notice the oblivious pilot of a massive dirigible whistling casually away much like Steamboat Willy. Or maybe you’ll pick up on the fact that, for no logical reason you can fathom, there’s a ladybug strapped to that incoming missile, and wonder if you’ll spend the rest of your life not knowing why. If you enjoyed this Q-YO Blaster review, you're encouraged to discuss it with the author and with other members of the site's community. If you don't already have an HonestGamers account, you can sign up for one in a snap. Thank you for reading! None of the material contained within this site may be reproduced in any conceivable fashion without permission from the author(s) of said material. This site is not sponsored or endorsed by Nintendo, Sega, Sony, Microsoft, or any other such party. Q-YO Blaster is a registered trademark of its copyright holder. This site makes no claim to Q-YO Blaster, its characters, screenshots, artwork, music, or any intellectual property contained within. Opinions expressed on this site do not necessarily represent the opinion of site staff or sponsors. Staff and freelance reviews are typically written based on time spent with a retail review copy or review key for the game that is provided by its publisher.